An attachment can be a picture, a word document, a movie, a sound file, an excel document, or any other file that requires another program to open it. Attachments may also include computer viruses, trojans, worms, or other malware. 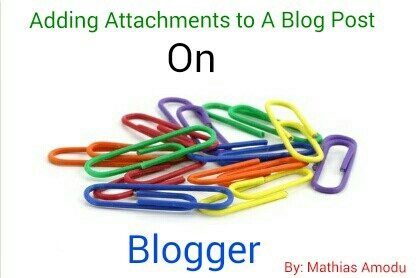 So today am going to teach you how to add attachments to a blog post on blogger and just follow the steps below carefully. First you need to login to your blogger dashboard and then select your preferred blog. Then click on the tab labeled "New Post" at the top left side. Now click the painting icon on the toolbar located at the top to add an image to your blog post or click the film icon to add video to your post. Finally create your unique post. Then click the "Publish Post" button. Now your recent published blog post will now show up on your blog with your preferred media item attached to it. You sed attachment, that got my attention but it's just picture and video u wrote about. What about attaching pdf files directly to post??? Hello you can use the HTML embed code copied from Google Docs to your Blogger Post then a window will display the PDF content on your published post to your viewers.